I've been using Ravelry for years now to find crochet patterns and store information about the things I've made. This summer,however, I've finally branched out a bit--first modifying patterns I'd found in minor ways, and then finally coming up with my own pattern for an item that I needed. Since Ravelry won't let you share a pattern that hasn't been published elsewhere, I'm publishing my first original pattern here so that I can then put it up on Ravelry. 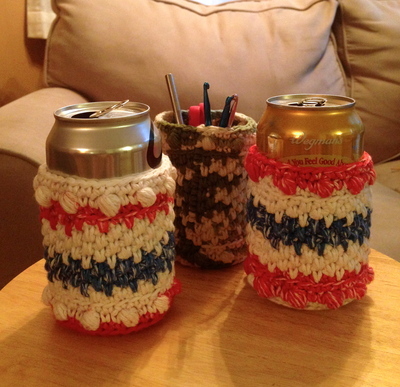 It's a can cozy, made from cotton yarn, intended to keep cans from dripping in the humidity. I made my first one a week or so ago, and have been using it daily since then. Now that I know it works well, I've written up the instructions for how to make one of your own! The body of the cozy uses a spike stitch that results in a very sturdy weave. The top and bottom are embellished with bobble stitches, which also keep the cozy from slipping in your hand. 2. Gauge: 3 rounds of DC (base) = 2.75"
3. Bobble Stitch (BS): *YO, insert hook into stitch YO and pull loop through* repeat* 4 more times, YO pull loop through all stitches on hook. 4: Spike Stitch (SS): SC over current stitch into space below. Row 4: Ch1, sc in back loop only of each st. Join with slipstitch in first st.
Row 5: Ch1, *sc, BS, sc* 11 times. Join with slipstitch in first st.
Row 6: Ch1, sc in each st. Join with slipstitch in first st.
Row 7: Ch1, sc in back loop only of each st. Join with slipstitch in first st.
Row 8: Ch1, sc in first stitch, *SS in next st, sc in next st*, repeat from * around. Join with a slipstitch in first st.
Row 9: Ch1, SS in first stitch, *sc in next st, SS in next st*, repeat from * around. Join with a slipstitch in first st.
Row 19: Ch 1, sc in back loop of each st. Join with a slipstitch in first st.
Row 20: Ch1, *sc, BS, sc* 11 times. Join with slipstitch in first st.
Row 21: Ch 1, sc in each st. Join with slipstitch in first st, finish off. I scrapped my Game Design & Development lecture today, and instead I spoke to my students about Aaron Swartz. His accomplishments, his impact, his death. The brokenness of the systems that he fought against, and their role in destroying him. And depression--how to recognize it, and what to do about it. Then I asked them to read these articles, to understand Aaron and how and why he died. If you haven't read them already, too, you should. 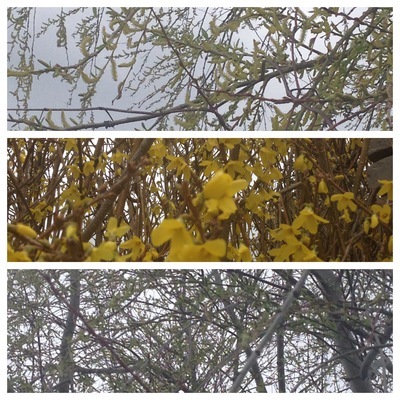 There's more--so much more--out there, but these are the ones I thought would be best to start with. family latke recipe: now with pictures! Way back in 2004, I posted my family latke recipe (much to the dismay of my kids, who felt I'd somehow betrayed my legacy). Tonight I decided it was time for an update--not the recipe itself, which has stood the test of time for generations, but the presentation of the recipe. So here it is, with illustrations! 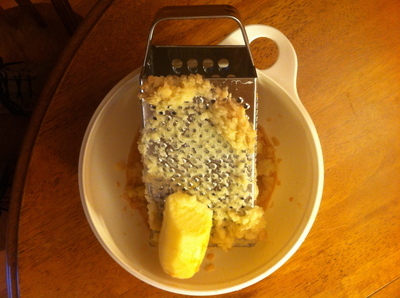 I've read a number of articles that claim you can use a food processor to grate the potatoes, and then use a cheesecloth to squeeze out the excess water, but I'm too wedded to my traditional process to try this. Grate the onions the same way, and mix into the potato mixture. Use a ladle or large spoon to remove excess moisture...we put a heavy metal ladle onto the mixture, and the liquid drains into the ladle over the edges. Keep this up for as long as you have the patience for it; removing the water helps the pancakes stay together better when cooking. 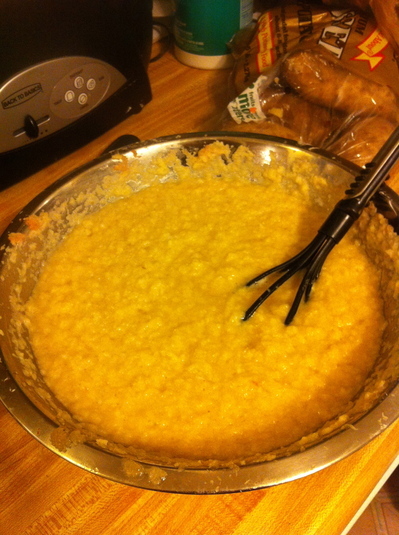 The mixture should be less like applesauce and more like mashed potatoes when you're done--but there's room for error, since you can add more eggs later to compensate for too much moisture. After removing the water, add in the eggs and salt, and mix with a spoon or a whisk. The resulting mixture should have a texture a lot like cooked oatmeal. Heat 3/4" to 1" of oil (we like peanut oil, but canola oil works too) in a large skillet (preferably cast iron) until a drop of water "pops" when dropped into the oil. Pour some of the mixture in with a ladle or large spoon. If it falls apart, it means that either the oil is too hot, or the mixture is too watery and needs more egg. If it drops to the bottom without bubbling at all, the oil's too cool and the pancakes will be soggy. Experiment with temperature first, because it's easier to undo than changing the ingredients. 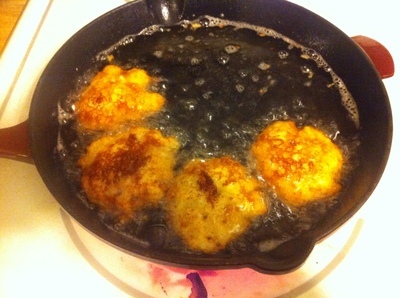 Latkes should float above the bottom of the pan, not stick to the bottom. Use a slotted metal spatula (not plastic, as that will melt in the hot oil!) to dislodge them if they stick. When edges start to brown, flip them over (gently, so as not to spatter yourself with hot oil). 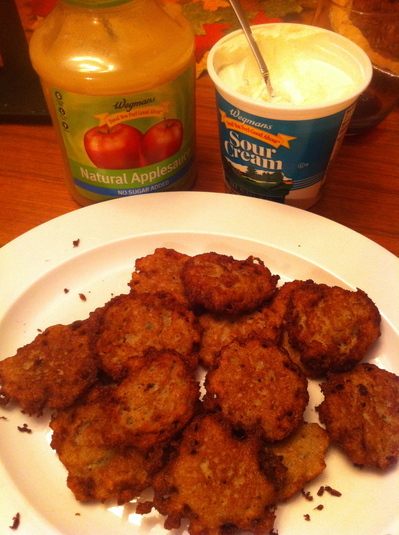 Latkes should be served with sour cream and applesauce--while I can't imagine eating mine with anything but sour cream, I know plenty of applesauce aficionados. This doesn't quite rise to the level of the other latke war issues, but it's wise to have both on hand. A few weeks ago, when my friend Elizabeth and I decided to spend a couple of days in New Orleans together, I went online to book my flights. Normally I'd use either Kayak or an airline site, but I decided to give the American Express travel site a try, since it would mean more membership miles in my account (and I'm saving them up in hopes of upgrading my trip to Dubrovnik in the spring). I'm a pretty experienced travel booker, but I was a little sleepy when I made my plans, and when I saw an itinerary that involved leaving New Orleans at 7pm and getting into Rochester at 11:30, that looked perfect. So I booked it. Unfortunately, it turned out that I didn't look closely enough, and the itinerary has me arriving at 9pm in Atlanta, but leaving at 9am tomorrow and arriving at 11:30am. Seriously, Amex? You couldn't have made that clearer in your interface? Delta doesn't even offer that itinerary as an option on their site. And every decent travel booking site I've ever used has made it very clear that an itinerary involves an overnight. Okay, I thought, at least Delta has a same-day travel change service that only costs $50, so I'll call the day I leave and see if I can get on an earlier flight. But no. When I called Delta today to inquire about doing that, they said I couldn't, because the overnight layover means only the Atlanta leg would be "same-day." If I want to change my flights, it would cost me about $500 in change fees and fare differentials. So it seems I'll be staying in an Atlanta airport hotel tonight. And you can bet I won't be booking it through the Amex travel site. Update: It's actually a double-fail, because in addition to not warning me about the overnight, somehow Amex failed to actually get me seat assignments. I distinctly remember picking seats when I booked the flight, but when I went to check in online just now I was told my seat would be assigned at the gate--which happend flying into New Orleans, as well. Bah.